Includes a bonus e-book of Supercharge Power BI. You are ordering a physical copy of the book. While you wait for the physical book, you can immediately download a DRM-free version of the e-book. You can choose PDF, ePub (for iPad), or mobi (for Kindle). Power Pivot is a self-service business intelligence tool that comes bundled with Microsoft Excel. Anyone can get started with Power Pivot by enabling the add-in, loading some data, and building a pivot table. But that basic approach allows you to only scratch the surface of Power Pivot’s capabilities. 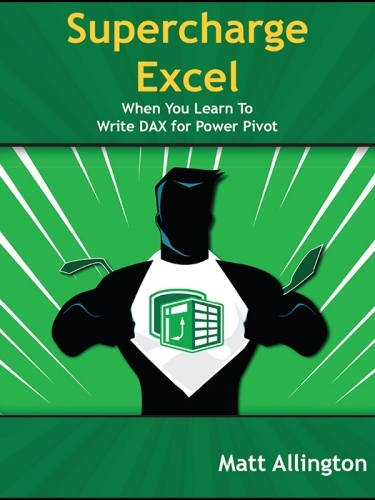 If you want to be able to supercharge Excel using Power Pivot, you need to learn to write DAX, the formula language of Power Pivot for Excel and Power BI. With the help of a good book that prompts readers to put their new skills to the test, Excel users can rather quickly learn the required DAX skills. 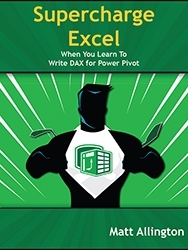 This is such a book, written to give you hands-on practice using Power Pivot for Excel and writing DAX. Inside you will find explanations of concepts, examples, worked-though exercises, and practice exercises and answers to maximise learning retention and experience. Matt Allington is a career data professional who has worked in the retail and consumer packaged goods industries for 35 years. He is a Microsoft MVP and specializes in Power BI, Power Pivot, and Power Query. This is the expanded and updated 2nd Edition of Rob Collie's DAX Formulas for Power Pivot. You'll go bananas as you replace tedious data cleansing with Power Query. This is the print book version of the definitive book on Power Query for Excel. While you are awaiting your shipment to arrive, you can download PDF, ePub, and Mobi editions.